ABOUT - "Official BYOP® - Oklahoma City ​Program"
Innovator, teacher, motivator, sports marketer, fundraiser and visionary who put athlete opportunities first, Ruth N. Nelson has gained over 40 years of experience that encompasses successful coaching (16 years at the collegiate level at George Williams College, University of Houston, Louisiana State University and the University of Iowa) with a total of over 500 wins. She also had 3 University of Houston Players (Hyman; Crockett and Magers) start on the 1984 Olympic Team and was the pioneer in the recruitment of minority athletes in the 70s. 5-time Olympian Danielle Scott was part of her first junior club program in Baton Rouge, LA (Baton Rouge Volleyball Club). In addition, Nelson was USA National Team Player, USA National Team Assistant Coach, USA National Team Technical Advisor, USA Junior National Team Head Coach, USA World University Games Head Coach and Dallas Belles Major League Volleyball Professional Team Head Coach and, most recently, Head Coach of USA Volleyball Senior A2 Team (now the A2 Collegiate Team). Innovations have included the creation and development of the Bring Your Own Parent (BYOP®) Program, the Nelson Aquatics Resistance Training (NART™) Program and the MVP Specialized Jump Training Program (Jump Like An Olympian). 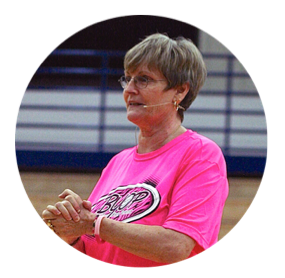 Over the past 15 years, Nelson has specialized in training 5-10 year olds in her BYOP® Program. Ebony Nwanebu, All-American starter at USC & Texas, was one of Nelson’s first BYOP® players at age 4 ½. Others have included Mary Kate Marshall, PAC 12 Freshman of the Year at Oregon State; still others have gone on to be successful at Cornell, Columbia, Binghamton, Barry, Belmont, Indiana Wesleyan, Newman and Cincinnati. Nelson’s experiences have resulted in her abilities of not only analyzing individual fundamental skills, but also teaching effective decision-making and execution of tactics within game strategies; unlocking athletes’ capabilities, developing their self-esteem and self-confidence and performance under pressure; jump training (yielding increased height in jumps and improved performance without injuries) and evaluating teams at any level of competition. Since her “Statistical Analysis of Passing and Serving” in her Master’s thesis she has begun gathering data for ages 4-10 in jumping by utilizing the VERT technology and as well as testing different size, color, and their weight for the new line of BYOP® volleyballs. Because of Nelson’s experiences, expertise and honors, she has conducted over 600 presentations at various conferences, seminars, and workshops, worldwide. Topics have included college camps; high school motivational speaking; successfully training youth in volleyball; becoming knowledgeable in the college-selection process; marketing the student-athlete; developing fundraising programs for nonprofit organizations, telecommunications companies, corporate cause-marketing programs and national sports governing bodies. Most recently, presentations have been at the AVCA Conventions and Art of Coaching Clinics. In additional there was a feature article on BYOP® (Bring Your Own Parent) in AVCA’s Volleyball Coaching 2.0 as well as being featured in the first Coaching Wizard book released in December of 2016.